Magda Kline, the daughter of German immigrants, grows up on a rural farm in Gettysburg, Pennsylvania. Her life is carefree and full of love in the beautiful home of Stone Croft. When her father, Jonas, expands Stone Croft’s holdings, he hires farm hand Lars Sutler, and Magda falls in love. Soon the rumors of war become headlines of battles and she must let go of Lars when he joins the 11th Pennsylvania. 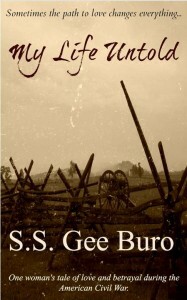 The effects of the war are felt in Gettysburg, but it is not until the bloodiest, three day battle of the Civil War is fought at her door step that Magda experiences the true horror of war and her life is changed forever. S.S. Gee Buro boldly explore the acts of mankind during war and how far one woman will go to save the man she loves. My Life Untold currently has 4.7 out of 5 stars from 28 Amazon reviewers. You can get a free download of the Kindle book today, January 20, 2014. For more free eBooks, check out our 10 Websites to Download Free eBooks list, as well as our Free eBook of the Day archive.